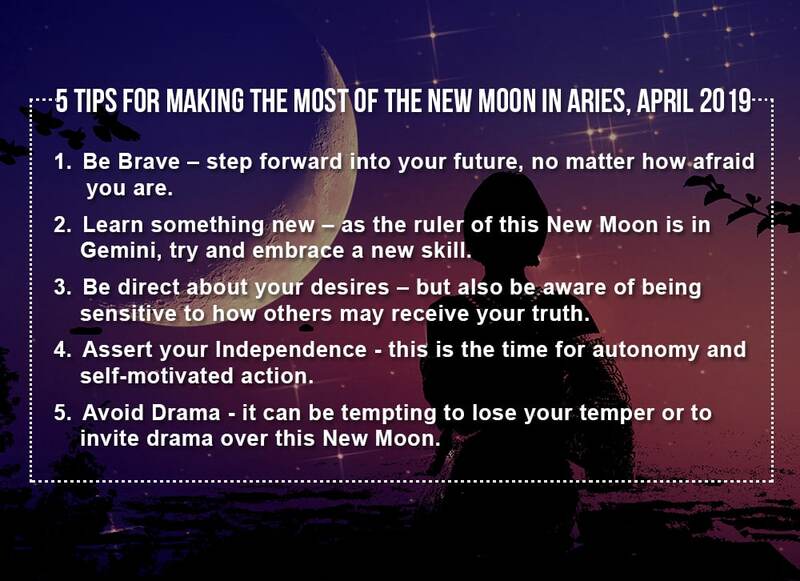 Aries Season is in full swing in April 2019, and the New Moon in Aries on the 5th of April will be one to remember! Not only will the mighty Sun be in Aries for almost the whole of April, but towards the end of the month, this New Moon will be concluded with a Full Moon also in the sign of Aries. This is a double whammy of the sign of the Warrior, and for many of us, the slow, sluggish start to the year will be suddenly propelled forward into motion. Seeing as this is the first sign of the zodiac, in many ways this New Moon, which is a Moon Phase that also represents new beginnings, can be a fresh start for us. Whilst most of the world celebrates the beginning of the year on 1 January, astrologically the New Year started on 21st of March as the Sun entered Aries and the Northern Hemisphere celebrated the start of Spring. This New Moon kicks that start into forward motion, and we can feel impassioned, enthusiastic and ready for action. Aries is the sign of the Warrior, and being a Fire sign, also indicates that collectively, we will feel emboldened to make a move in life, to sow seeds and take a bit of a risk. 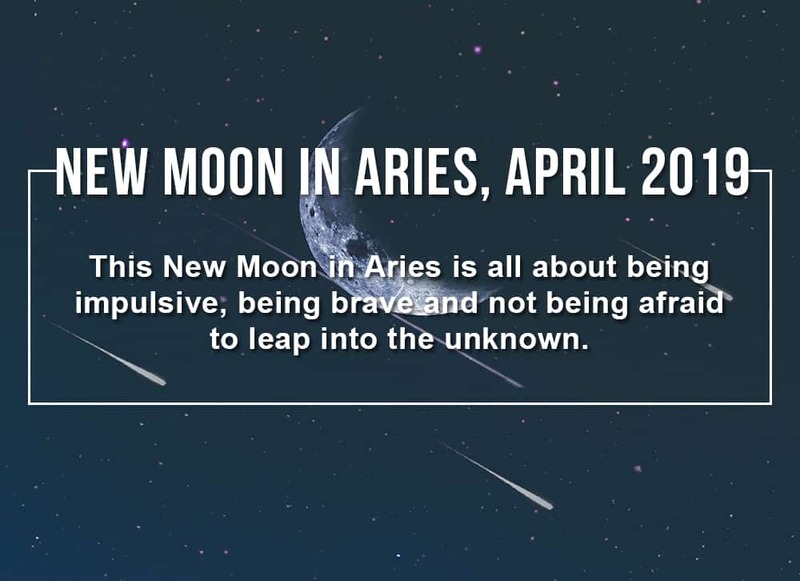 This New Moon in Aries is all about being impulsive, being brave and not being afraid to leap into the unknown. Being the first sign of the Zodiac, this New Moon in Aries will emphasise the need for independence and autonomy. The ruler of the sign of Aries is Mars, planet of drive and action. Mars will be in the chatty, restless Gemini, and so we can all tap into the desire to create a bit of variety in our lives, to embrace learning new things, keeping our lives fresh and interesting. Saturn and Pluto, both intense and dramatic planets, will be casting a tense angle to this New Moon in Aries, and so we could feel as if we are in a pressure cooker, ready to explode. It becomes imperative for us to be gentle on ourselves during this heated New Moon and to watch for signs of fear which may hold us back from stepping forward into our power and independence. Intense emotions will be felt and although we can control them, there will be moments of crisis where we are challenged to be brave despite our fears of the unknown. This is a big time for Aries folks. In all ways, this is YOUR new year and the focus will be on how you direct your life, what you fill your environment with, as well as your physical body and image. Now is the time to embrace a new look, exercise regime or start a new path of self-development. For the second sign of the zodiac, this New Moon asks you to take a good look at your finances, and move beyond a place of fear or lack. It’s time to look at new ways of handling your resources – what you earn, how to earn more and how to save better. Gemini’s are in for an active, exciting time over this New Moon as Mars cruises through your sign. 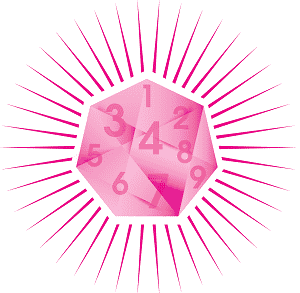 This New Moon for you embraces variety and encourages you to take up studies, do a few workshops or even buy a new car. Try not to let mental insecurities stop you from learning all you can. Cancerians may feel the New Moon in Aries to be emotionally intense, especially when it comes to family matters, but there are opportunities to start afresh. It will be important for Cancerians to avoid drama and to encourage spreading feelings of love and connectedness. Leos should enjoy this New Moon, being a fellow Fire sign. This can be a creative beginning for all Leo types, and the focus is on developing your passions without second guessing yourself – confidence will be key for Leos over this New Moon. For the Virgo, this New Moon in Aries gives you the opportunity to get your house in order. Your new beginning is all about creating a routine for yourself that feels healthy, but not constrictive. The lesson here is to be gentle on yourselves. Being the sign opposite to Aries means that your new beginning relates to balancing your relationships with independence as well as time together. Be brave enough to communicate how you feel and start a new dialogue, without the need for drama. For Scorpios, this is a powerful New Moon of change, although it can be intimidating at first. This New Moon offers transformation on many levels, including your intimate relationships, as long as you allow yourself to open up. As the last of the Fire signs, Sagittarians will enjoy the impulsiveness and dynamic energy of this New Moon. This is the time to plan a trip somewhere you have been craving to go, or to expand yourself by doing some Self Development work. Capricorns are most likely to do very well with this New Moon, especially when it comes to your career. Perhaps this is the time to apply for that promotion and step forward into a new position or even an entirely new direction – as long as you believe in yourself. Aquarians can look forward to a new beginning when it comes to your friendships and dreams of the future. Now is the time to join a community or group who shares your ideals, and to not be afraid to be a leader – people look up to you more than you know! Pisceans will have the opportunity to create new beginnings in the area of their spirituality over this New Moon. Much of the work will be done behind the scenes and there can be immense growth when facing your deepest fears and thinking of new ways to deal with inhibiting subconscious patterns. Be Brave – step forward into your future, no matter how afraid you are. The rewards will be worth it as you claim your bright future! Learn something new – as the ruler of this New Moon is in Gemini, try and embrace a new skill – it will make you feel empowered and strong. Be direct about your desires – but also be aware of being sensitive to how others may receive your truth. Assert your Independence – this is the time for autonomy and self-motivated action. Our Relationships will ask for more attention towards the end of the month, but for now, it’s all about you. Avoid Drama – it can be tempting to lose your temper or to invite drama over this New Moon. Try your best to remain coolheaded and calm over this time. This is an energising New Moon which encourages all of us to know our courage and deal with the fears that hold us back from stepping into the future. 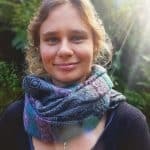 We are being asked to allow ourselves greater independence and to embrace all those things we may have been afraid to initiate – this can be an empowering New Moon when we are brave enough to take action. Aries Season is in full swing in April 2019, and the New Moon in Aries on the 5th of April will be one to remember! Learn how to make the most of it today!